Shinto Saw Rasps are manufactured from high quality saw blades with coarse teeth (11 teeth/inch) on one side and fine teeth (25 teeth/inch) on the other. Because of the saw tooth design, clogging is eliminated. Use the coarse side for shaping and very rapid removal of material and the fine side for a finish cut. 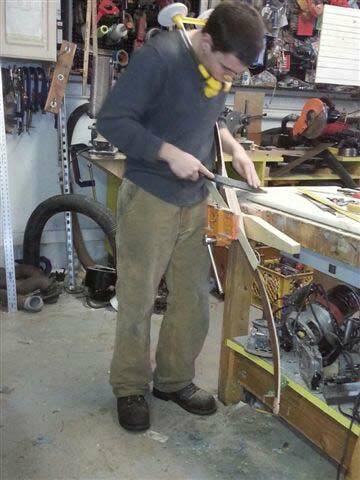 Wood carvers love our saw rasps. They are also suitable for use on plastics, fibre glass and soft metals. Blade length is 11˝, overall length is 15½˝. Used this rasp to bevel the top of a Original Gloucester Rocker for my grandsons. It is a joy to use! 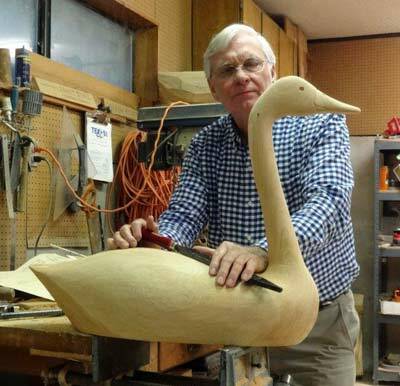 Chuck, The Shinto rasp worked real well on smoothing this Swan carving. It's a nice tool. 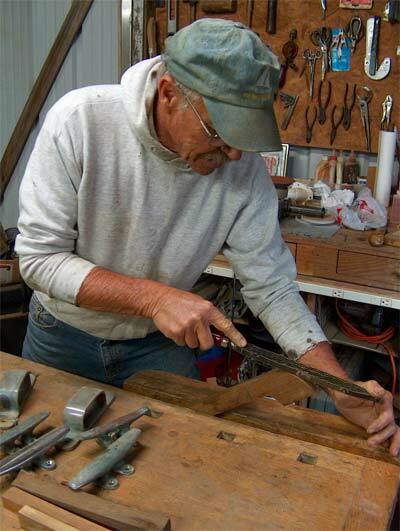 I was looking around in Chuck Leinwebers workshop, so like mine, full of tools, dust and partly completed projects, shelves full of interesting things and machinery lurking in corners, just the place to keep me occupied for hours. While we chatted he handed me a thing that looked like the unplanned result of a late night liason between a cheese grater and a horse hoof file and suggested I try it. Ok, into the vice with a piece of stringy yellow pine and in an instant the end was rounded! Then the corners radiused, much amazement, then a flat surface dented by an unpadded clamp was planed smooth. Effortless, I flipped it over to the fine cut side and tidied the job up. Not perfect, but a swipe with 80 grit would have seen it ready to undercoat of it were part of a boat. This is an interesting tool, it cuts hardened epoxy with ease, smooths and planes wood, softer plastics, fillers, glues and. 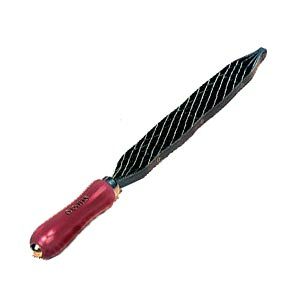 paint More than just a rasp, better than the surform file I sometimes use and way better than most sandpapers for rough and shaping work, this tool is a very useful addition to the plywood and epoxy boatbuilders toolkit. I like it, one will be going home with me! 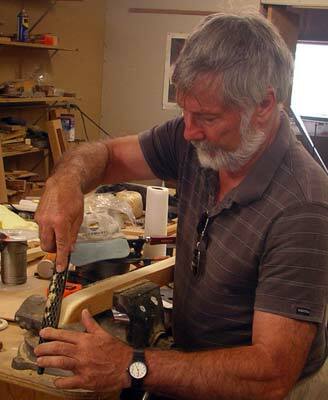 John Welsford, proud to be a quick and dirty boatbuilder. The rasps and respirators are a blessing for building bows. The working faces of this tool are 1" wide and do a good job of evening up plywood edges where a low angled block plane would have some difficulty given that such edges have both cross and with-the-grain wood. It creates sawdust rather than shavings. 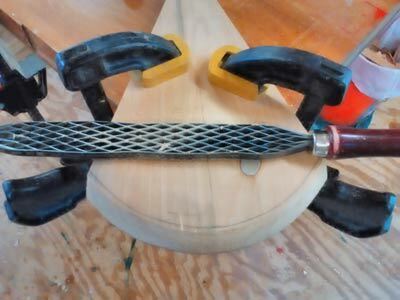 As the handle is in the same plane as the cutting edges, using it on large flat surfaces is difficult as one's fingers get in the way, which is one advantage the raised-handle Surform plane has over this rasp. On the other hand, having both course and fine surfaces in one tool is handy, and it certainly does not clog. It gets the job done much faster than a file and but is less coarse than the solid wood rasp I have. At first I doubted I'd have much use for it, but for the right application it comes in very handy. Like my very thin Japanese single edge rip saw, which has become a favorite for various applications in part because it is fun to use, depending on the project at hand this handy tool may get a lot of use.